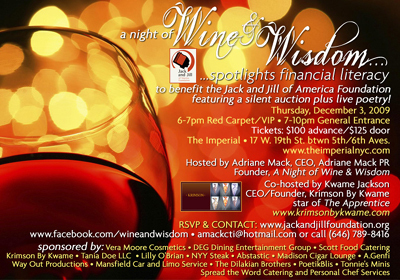 Benefiting Jack and Jill of America Foundation. The Imperial, located at 17 W.19th Street, New York, New York. This will be a star studded red carpet affair, hosted by Kwame Jackson of Krimson by Kwame (The Apprentice), Adriane Mack of Adriane Mack PR. Investing Pays Off! ®: financial literacy curriculum. Join us and taste wine with the stars, admire fine art, relax to poetry & music while enjoying decadent food bites donated by sponsors from the New York City area. There will be gift bags from local and national sponsors, and raffled off prizes from Way Out Productions/ Grey Goose, NYY Steak, Mansfield car & limousine service, Vera Moore Cosmetics and Ta’nia Doe LLC, to name a few. Upon arrival, guests will be greeted with a glass of champagne. Opening greeting bestowed by Erik Cliette, President of Jack and Jill of America Foundation, Kwame Jackson, Adriane Mack and poetry performance by PoetikBlis. Throughout the evening hor’dourves will be served courtesy of Dining Entertainment Group and other fine cuisine restaurants. Wine will be presented from some of the best wine purveyors in America. A Live/Silent art auction and exhibit from The Dilakian Brothers and a fashion trunk show from Krimson by Kwame. This will be a memorable night, pack full of entertainment! The Jack and Jill of America Foundation, Inc. exist as the philanthropic arm of Jack and Jill of America, Inc. Since its inception in 1968, the Foundation has acted to influence the ongoing positive development of children and distributed millions of dollars to communities all across America. Tickets are $175 presale and $200 at the door.